Vaikuntha Ekadasi (December 28th/29th 2009), is considered to be the most important Ekadasi in the Sri Vaishnava tradition. Ekadasi means ‘the eleventh’ in Sanskrit and refers to the eleventh day of the bright fortnight (shukla paksha) belonging to a lunar month. Vaikuntha Ekadasi is the 11th day in the lunar calendar after the new moon in Dhanurmasa (December 15 – January 15). It is considered to be the day on which the doors of Vaikuntha (heaven) will be kept open for all the saintly souls. According to the Vishnu Purana, observing the Ekadasi Vrata (or fast) on Vaikuntha Ekadasi day confers the benefit equivalent to observing all the other eleven Ekadasis during the year. Fasting (according to one’s capacity), chanting the names of the Lord, visiting Vishnu temples are some of the ways this festival is observed. In some temples, this festival is celebrated over five days with special Pujas on all days. Devotees also get a chance to go through a sanctified entrance called “Vaikuntha Dwaaram” (doorway to “heaven”) on the Vaikunta Ekadasi day and participate in the continuous chanting of the Vishnu Sahasranamam (one thousand names of Lord Vishnu). 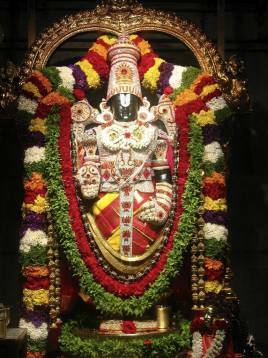 Lord Venkateshwara opened the gate of Vaikunta (his abode) for two demons in spite of they being against the Lord. They asked for the boon that who ever listens to their story and sees the image of Lord coming out of the door called Vaikunta Dwara, will reach Vaikunta. For the same reason, temples all over India make a door kind of structure on this day for devotees to pass through. The day is observed as a very sacred day by all the Vishnu bhaktas and many people fast on that day. It is believed that by observing a fast on that day and spending the day in poojas and prayers to Lord Vishnu, one will be absolved of all sins and will attain Moksha and the doors of Vaikunta will be kept open for the soul after it leaves this physical body. The soul does not have a rebirth anymore and attains the feet of the Supreme Lord. According to the Padma Purana, during the Krita Yuga (also termed the golden age), an asura or demon called Muran harassed both the devas (Gods) and mortals. Unable to bear his tyranny, the devas sought refuge in Shiva. He directed them to approach Vishnu. Vishnu agreed to help the devas and went out to battle with Muran. During the long battle, which lasted one thousand celestial years, Vishnu needed to rest for a while. He entered a beautiful cave called Himavati in Badarikashrama to sleep. Muran wanted to strike Vishnu while he was sleeping. However, Shakti – Vishnu’s female energy – emerged out of his body and assumed the form of a beautiful damsel who fought Muran and vanquished him. When Vishnu awoke he was very pleased and named this maiden as Ekadasi and granted her a boon. The maiden said, “O Lord, if You are pleased with me and wish to give me a boon, then give me the power to deliver people from the greatest sins if they fast of this day”. Vishnu granted her the boon and declared that people worshipping her would reach Vaikuntha. Thus, it is said, was born the first ekadasi, which was a Dhanurmasa shukla paksha ekadasi. Sages and devout people have been since, observing the ekadasi vrata regularly. Here, the demon Muran represents the tamasic and rajasic qualities in us. The import of the ekadasi vrata is that one can conquer rajasic and tamasic tendencies in us through fasting. This helps us reach our ultimate destination, Vaikuntha, which is the place or stage of no ‘kuntitha’ or dullness, stupidity and misery. It is also said that on this day the ksheerasagara manthana (churning of the ocean) took place and the nectar of immortality (amritha) was distributed to the gods. this knowledge ofenternce in Vaikuntha is one of the biggest knowledge in my life. its realy very good. I am 58yrs old. I am keeping fast on every ekadasi from last 30 yrs. Now I would like to celebrate my ekadasi vrat. please guide me when and how can i celebrate? your kind advice will be oblige to me.I am gujarati vaishnav.